Q: What is the longest period covered in financial accounting? A: Accounting periods are generally one year. I've never heard of it ever being longer than a year. However, that is for financial accounting or historical accounting, which is what we are dealing with on this website. Historical accounting shows the state of a business in the past. The financial statements, such as the income statement and statement of changes in equity, show the past figures of the business. There is also something called management accounting. This is the subject of preparing reports for management of a business so they can plan and make decisions. Management accounts don't necessarily deal with historical information only (as is the case with financial accounting). They can also deal with future (projected) figures, in other words with budgets and future goals. Management accounts can be drawn up over any period that is deemed useful by the users of the reports. So they can cover a period of a month, a week, a year, 2 years, whatever is needed. 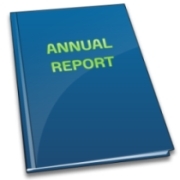 Which of the following sections in a Company's annual report is NOT audited? I'm not 100% sure on this one but believe it would be the director's report. The director's report, from my understanding, is just a statement/essay basically of the director's view of how the company has performed during the year. This would not really need to be audited I don't think. The F/S and their notes definitely need to be audited. The director's declaration is compulsary per accounting rules and so this would need to be audited quickly by simply checking that it is there and has been stated correctly.